Model was built in wood wirth styrene and stamped metal overlays, following information about the car in the 1953 edition of Car Builder's Cycopedia. Lettering is a combination of decals and hand lettering. It includes all the fractional dimensions. Weathering was done with 'dirty DioSol' washes and chalks to put on road grime, grease stains from the door track mechanism and salt streaks. 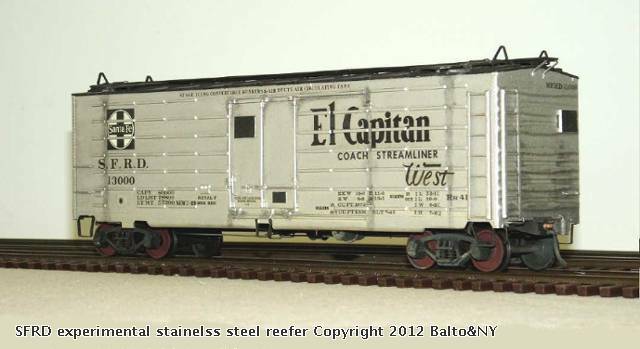 Santa Fe had Consolidated Steel Industries build this one experimental car in 1948 as a state of the art iced reefer. Many of its features were adopted in modernizing older SFRD cars. But only this SFRD car had stainless steel siding.